Maintaining good oral health is not as easy as simply brushing your teeth when you wake up and go to bed. Of course, we also know that flossing, using mouthwash, and visiting the dentist all play an important role in keep your mouth healthy. However, you may not have known that your dietary choices also play a big role in your dental health. So, next time you go to grab a snack, be careful with what you choose. Below, Dr. Van Treese in Sidney, OH offers several foods and drinks that may be damaging your teeth as you consume them. 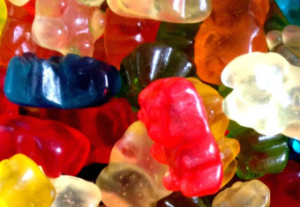 kiness makes these candies a disaster for the health of your teeth. Examples: Skittles, toffee, taffy, gummy bears, jelly beans, etc. Hard Candies: Whether you chew on them or let them melt in your mouth, hard candies are bad news. Option 1 – Chewing on the hard candy. Unfortunately, this can cause you to damage the enamel of your teeth and can cause a dental emergency in some cases. Option 2 – Letting the candy melt in your mouth. This is dangerous to the health of your teeth, as it fills your mouth with sugars and syrups for long periods of time. Examples: Jolly Ranchers, Candy Canes, Ring Pops, Life Savers, etc. Citrus Fruits: Acid is one of your teeth’s greatest enemies. Acid can cause your tooth enamel to erode and put you at higher risk of developing cavities. Examples: Lemons, limes, grapefruit, oranges, etc. Foods that contain starch: If a food contains a high amount of starch, it can easily get stuck in your teeth. After eating foods with starch, you should try to floss and rinse your mouth out. Examples: Potato chips, pretzels, cereals, crackers, etc. Soda/pop: Your dentist will probably tell you that soda is the most important thing to avoid in maintaining great oral health. 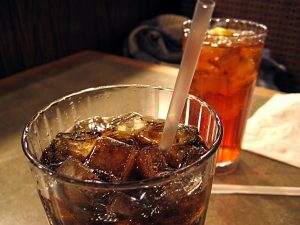 The harm from soda is due to the acid content and high sugar content. The acid in soda wears your tooth’s enamel down and the sugar assaults your teeth. Adult beverages: Alcohol causes your body to dehydrate. Dehydration then leads to dry mouth, which leads to cavities and gum disease. Saliva is one of the most important defenses we have against mouth diseases, and it is important to keep your saliva flowing. Coffee: Similar to alcohol, caffeine dehydrates the body. Unfortunately, what makes coffee even worse than alcohol is all the extra sugar that we add to our favorite morning drink. Additionally, coffee is a big contributor to tooth discoloration. Sports drinks: While these are great when you are exercising, drinking them in excess can be harmful to your dental health. Sports drinks usually contain a lot of sugar and food coloring, which can cause tooth discoloration. Dr. Van Treese hopes that the list above can help you have a healthier mouth. If you are in need of a dental checkup, feel free to contact us today at our office in Sidney, OH.